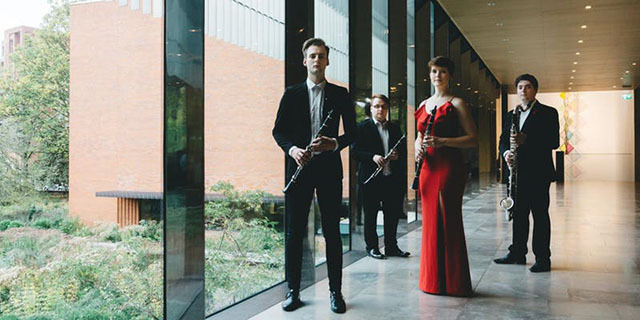 Etherow Reeds present a relaxed evening of music for clarinet quartet featuring new commissions by emerging local composers from the University of Manchester and the RNCM. This is also an exciting opportunity to get acquainted with the lesser known bass clarinet quartet, music for which will feature in the programme. Etherow Reeds was formed at the Royal Northern College of Music in September 2017. The group is made up of clarinettists Ruaridh Bakke, Andy Mellor, Katherine Blumer and William Curran, brought together by a love of chamber music. Performance highlights have included a spotlight performance at the RNCM and a performance in the Didsbury Coffee Concert series, as well as a newly organized schools education programme. Last year, they were selected as finalists for the prestigious Tunnell Trust Music Awards. Tickets are £3 advance – buy here.